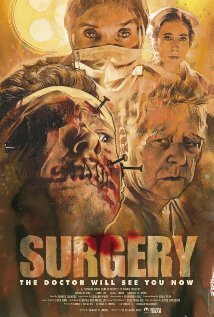 A short film made by the Clemens brothers from a final idea by their late father Brian Clemens (Captain Kronos Vampire Hunter), SURGERY encompasses what is best of horror. The short follows a man being tortured to the tunes of what should have been the soundtrack to a Hammer Horror film and Tchaikovsky's 'Sleeping Beauty Waltz' in the opening minutes. Insert shots of his lips being sewed up, nails being hammered into our victims forehead and his eye being gouged out with a rather nasty looking implement. His torture seems to come to an end as we next see our victim now known as Mr Shaw in hospital surroundings with a surgeon looking over his wounds. The surgeon notes that they can not use anaesthesia as he may go into a coma and may not be able to come back. His lips are scissored open from its webbed prison allowing Mr Shaw to talk but then the real pain begins as the surgeon removes the nails one by one, and it is here that we get to see what the madman had done to his eye as within his very socket the madman had placed a dolls head. Why has he been chosen? Well the final minutes of this short will leave you questioning your own views on his torture. Samuel Clemens has managed to write a script that tells a whole story within its short time frame of 11 minutes all the while making you clamour for more. Well directed and acted throughout, it makes you wonder what these brothers have hiding up their sleeves for future projects.